The World Retail Congress usually sets the agenda of the upcoming big questions in European retail for the next year. But even if a new kind of retail is emerging, the context and trends usually reach the Scandinavian countries with one or two years delay. 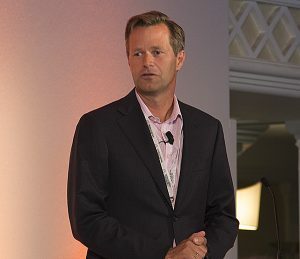 Rune Jacobsen, Head of Retail at the Boston Consulting Group, moderated a seminar about transformation, but sees big differencies between retailers in Nordic countries. ”Norwegian retailers make to much money and need to be in control of their assortment before taking the next step,” he says while pointing out differencies in corporate cultures and competition. As the Head of Retail within the Boston Consulting Group, Norwegian Rune Jacobsen has met several of the larger Nordic retailers, usually when the company needs a change. But transformation work differs a lot between the Nordic countries. ”There are completely different efforts needed. I’d say it’s a lot easier to succed with a transformation and an implementation in Denmark – and in Finland – than it is in Sweden and Norway,” Rune Jacobsen says. He believes it is mainly due to different company cultures – and national cultures. But when it comes to changes taking place in the retail business at the moment. Norway and Finland are usually considered the last in line of the Nordics to have the same context regarding e-commerce and omnichannel as Sweden and Denmark adapted. Sweden’s got some big players in retail, setting the agenda. Ikea and H&M are at the forefront testing new techniques and Ica is expanding its e-commerce and payment options. In Norway, Norgesgruppen and Varner – the two giants within grocery and fashion respectively are more into traditional retail. So they are not left behind? Elkjøp and XXL are Norwegian examples of succesful exports, where at least Elkjøp has adopted an omnichannel approach. Rune Jacobsen concludes they are culture driven and customer focused companies, like the Varner Group, but the focus is not on innovation. How long can they go on like they do today? ”They will have to take the next step within 2-4 years and it will go fast. We see new models coming”, says Rune Jacobsen.